When the mercury drops below zero, only two kinds of people are on the road: DPW drivers...and RUNNERS! A few days ago, the temp dropped to single digits. A local TV crew went out to interview any hapless souls they could find. One runner told them: "People say Runners are Crazy!" But that was back when the mercury was ABOVE zero. This morning it dropped to minus 7 degrees. That did not deter sixty of us dedicated runners. 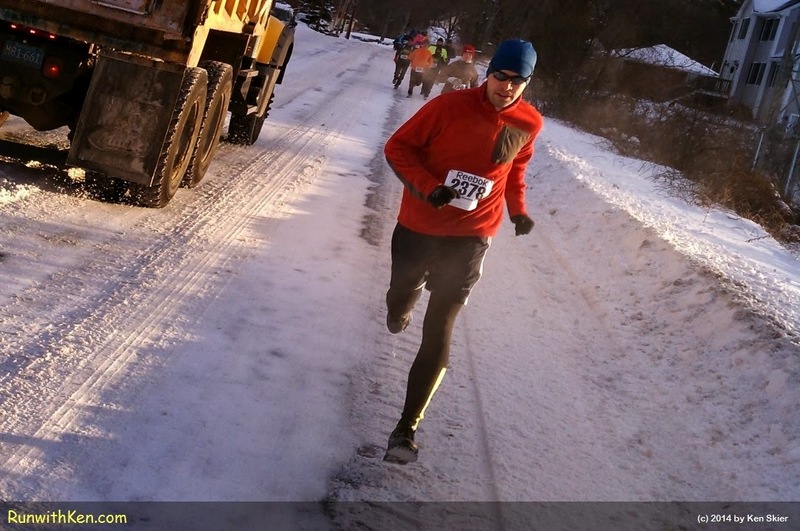 We gathered at a local 5K to run on the snow-covered roads. from the Department of Public Works. (I couldn't ask the driver what he thought of us. This runner was just behind me. With both of his feet off the ground! (I didn't stop or slow my pace.